So, this working on birthday thing failed, because the Film Festival is like that loud mouthed guest at the party who shows up uninvited, gets really loud and drunk, and draws in everyone to hear past war stories and upstages all your best laid out plans. But the sorbet at Cafe Luck was good, and I even convinced two of the shorts filmmakers to leave the Metro 4 and get the ice cream with me. And then I snuck into the theater near the very end of the show when space in the cinema had cleared out. I mean, the local shorts aired at 10:30 PM on a Saturday and it was way past a lot of people's bedtimes. I was in like flynn by the time all the children-centric films had concluded. I won't begrudge our local filmmakers for opting to stand outside in the lobby while the audience watched the whole series. 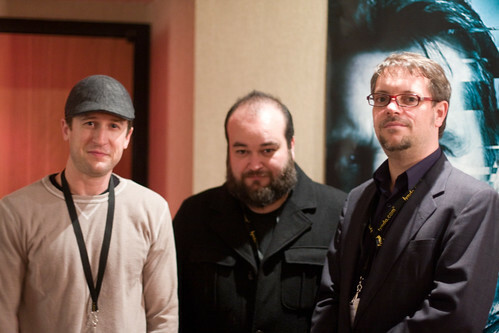 Pictured above from left to right: Jared Ingram (First Day), Jason Hallows (The Other Astronaut) and Ted Mills (Wallace Carothers). They talked of past film festival experiences, filming techniques, and projects they were working on. This was also my chance to chat with some of them and hand out a few compliments to them. I will, however, begrudge the local filmmakers who didn't show up for their own screening!! That's right, I'm looking at you, Jessica Hokanson, Kirsten Cavendish, Cameron Alexander, Joseph Dietsch, and Michael Warner! Surely you know that everything in Santa Barbara is 10 minutes drive from everything else, why weren't you there? Just how local are you, hmm?? Well, I'm sure they have their excuses. 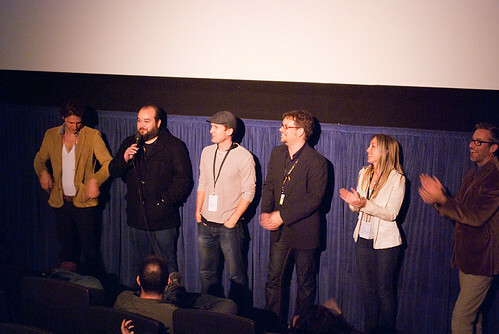 Meanwhile, our remaining filmmakers who did attend their own screenings took the time to stand up for Q&A afterwards. I noticed that the questions posted by the moderator were different than the first time around. Thank you for variety! This time there was a question on how the writers/directors acquired their cast. For the most part, the films were borne from creative minds with small budgets, so many called in the help of friends and family. It wasn't so much a matter of casting and auditions, but of bribing friends to give up their early mornings to help fill the spots. Sometimes it was the unconditional love of a parent who provided directorial advice, sometimes it was the fulfilled promise of mom's homemade lasanga that would get an actor to make the trek to Santa Babara for firming, sometimes it's just a shared fondness for film. There were exceptions, though. Alyssa Price was one of the few who did have a proper audition for her main character in The Monstrosity. Big thanks go to Michael Carman, Jason Hallows, Jared Ingram, Ted Mills, Alyssa Price and Garrett Swann for your contributions. Are you an inspiration for Santa Barbara! Ha. I see what you did there..